After a DQM QAPP EDD has been committed to the EQuIS database, DQM settings can be changed further. Configure checks, rules, parameters and qualifier to meet specific project data validation objectives. Note that the Global Parameters check holds the parameters used by all of the other checks. See DQM Global Parameters for a description of each Global Parameter. 1.Select a Premier Data license and navigate to the Data tab. The DQM Settings window has three tabs—Checks, Qualifiers, and Tools. Select a DQM_QAPP_CODE in the pull-down menu labeled DQM_QAPP. The menu comes from the RT_DQM_QAPP table. Select a check in the pull-down menu labeled Check. The menu comes from the RT_DQM_CHECK table. Each rule has its own qualifier, which can be selected from the drop-down list on this tab. New qualifiers can be added in the Qualifiers tab explained below. The ND_QUALIFIER is used as the DQM_QUALIFIER and APPLY_QUALIFIER during the DQM "Create Event" step when any Exception or Associated Result is non-detect (i.e. DETECT_FLAG = 'N'). Note: Due to the design of the DT_RESULT_DQM table, when a rule's qualifier is NULL, an error will occur during the Save Event step. ▪Set the rule’s qualifier to 'NQ'. ▪During the Create Event step, DQM will set the Apply Q column to NULL for all NQ qualifiers. ▪The results will still show up in the Exceptions tab of the DQM Process Event screen. To prevent a rule from being applied during the DQM process, set the STATUS_FLAG = 'R' for that rule. With this setting, no exceptions will be identified for that rule, regardless of other settings. When an Event is Saved, the DQM Q column is saved to DT_RESULT_DQM.QUALIFIER and the Apply Q column is saved to DT_RESULT_DQM.APPLY_QUALIFIER. When an Event is Completed, the Apply Q column is saved to DT_RESULT.INTERPRETED_QUALIFIER (and/or .VALIDATOR_QUALFIER) in combination with the other selected qualifiers (LAB_QUALIFIER, VALIDATOR_QUALIFIER and/or INTERPRETED_QUALIFIER). The Apply Q column is also saved by itself to DT_RESULT.DQM_QUALIFIER. The Remark column is also available for editing. The remark describes what each rule does and is stored in the DQM_REMARK column of the DT_RESULT table when a result record is qualified. 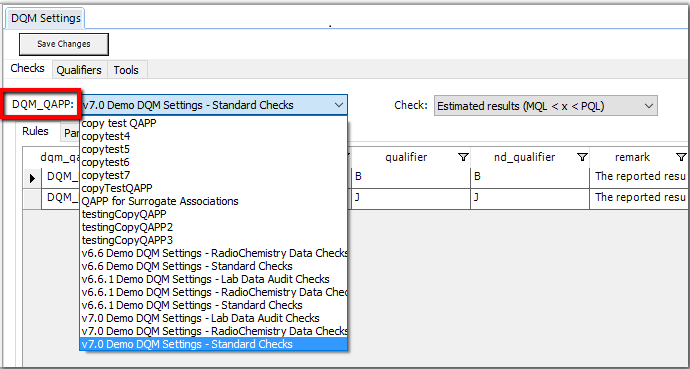 Within the Parameters tab, the user can modify and add to the parameters for each check (which are stored in the RT_DQM_CHECK_PARAM table). The Parameter and Value fields are required. The Analytic Method, Analyte, and MAG columns allow multiple values to be entered for specific methods and/or analytes for some parameters (as specified in the documentation for each DQM check). Use the values to define the scope of the parameter. Leave the Analytic Method, Analyte, and MAG null to assign the value to any and all Analytic Methods, Analytes, and MAGs or use the pull-down for each field to select a specific item or group. Note: The Holding Times Check is a special case. If it is selected, an additional HoldingTimeParameters tab will appear that allows the RT_HOLDING_TIME table to be edited directly from the Settings screen. ANALYTIC_METHOD, MEDIUM_CODE, HT_UNIT, and CALCULATION_UNIT are required. The Holding Times Check will only be applied to the time frames that have a value in the respective column. Qualifiers can be added and edited on the Qualifiers tab of the DQM Settings Form. Populating the Rank column with a '99' will disable the merge option that prevents duplicates. For example, with the settings in the image below, merging 'B' and 'BL' would result in a qualifier of 'BBL' instead of 'BL'. Note: The Save and Set All buttons are only accessible for users with the necessary permissions. •Select the DQM_QAPP to copy. •Enter the new Code, Description, and Remark. •Return to the Checks tab and select the new DQM_QAPP_CODE to change the settings. An alternate way to add a new DQM_QAPP_CODE is to make a copy of the DQM_Checks EDD used during the installation process, make the desired changes in Excel (do not forget to change the DQM_QAPP_CODE column in every worksheet), and load the new set of Checks using EDP. The DT_RESULT.VALIDATED_YN field should be filled in by most formats, but it is not a required field. To use the "Only return Unvalidated Results" option in the DQM Qualification Report, this field cannot include any NULL values. The Set All NULL VALIDATED_YN to 'N' button inserts a "N" value into any NULL valued DT_RESULT.VALIDATED_YN record. The DQM Settings Form has a Save Changes button, which turns red when a DQM Setting has been modified. Clicking Yes will move the cursor to the newly selected tab and all changes will be discarded. Clicking No will return the cursor to the original tab with the changes intact, but not yet saved.